We got back yesterday from a very fun week in Bear Lake! The boys had a really great time and it was nice to get out in the sun and play. I am so happy that the weather was really nice most of the time. On Tuesday afternoon a little storm blew through but other than that it was in the 70s most of the week. We went down to the beach a few times and to the pool a few times as well. The lake itself was freezing but that didn't keep the boys from wading in. Nathan especially loved going in the water. So we waded out there with them. The pool was really nice because the water wasn't very cold and they have a little kiddie pool that is perfect for young kids. Plus they put in a slide that Jason and Jakey loved taking turns going down. We ran into 3 other couples at the pool who had a child Nathan's age and 2 of those ladies were also pregnant and due a little before me lol. I feel bad for Nathan because his eczema has flared up again in the last few weeks. I'm not sure if it's the change in the weather or what, but I think getting him out in the sun more at Bear Lake helped, plus we've started putting his cream on it again. I just hope it doesn't get as bad as it was earlier this year. My psoriasis has gotten worse as well and I'm glad I was able to get some more sun this week because that helps. I will try to remember to get some pictures of our trip up soon, but I'm not promising anything lol. Very busy with school, being pg, and taking care of kids, barely have the energy to get out of bed most days! I have been so happy to be able to do reviews for CSNStores.com. They are great to work with and have so many items in their stores to choose from. With over 200 online stores you can find everything from cheap bedroom furniture to organizational products. I'm sure you've seen the reviews I've done in the past for them. I have another review coming up soon that I am so excited to share! The last product I was able to order and review was the Honey Can Do Triple Laundry Sorter in Chrome. We have always used the cheap triple sorters from WalMart and really they are junk, either the fabric tears easily or the frame breaks apart. So when I found the Honey Can Do sorter at CSNStores.com it looked perfect, sturdy and reliable. And it hasn't disappointed. It was pretty easy to put together and feels very solid. It barely squeezes into the area I have for it, luckily it wasn't an inch wider lol. I like that each basket is removable if you want. Plus it looks so much nicer than our old ones. As always, the shipping was fast and I had no problems at all with my order. I really do recommend checking out CSNStores.com for some excellent products. "You are going to have your hands full!" Especially when they see I already have 3 little boys. Yes, thank you, I realize that it will be a lot to handle, but I'll do it. Because that's what moms do, we take what we get and make it work. "Are they identical?" Short answer- we won't know until after they are born. Long answer- the only way to know for sure if they are identical would be if they shared the same sack (mo/mo) and/or placenta (mo/di) and the only way to know for sure if they are fraternal is if they are boy/girl. My boys have separate sacks and unsure on if the placenta is shared. After a certain point placentas can fuse together to appear shared when they are really separate. If we'd had an ultrasound earlier on we would know but by this point they can't know for sure so they just assume they have separate placentas (di/di). In the case of di/di twins there is about a 25% chance they are identical which can only be found out with dna testing after birth or if they look quite obviously different we'd know they weren't. "So glad it's not me!" Well, I know it's not what we planned, but I am glad it is me! God chose to send me two little blessings and I assume he knew what he was doing and that I could handle it. I feel very blessed. "So, will you need a c-section?" This is one of those things that we just have to wait and see how things are going. If Baby A is head down at delivery time and I am having no other complications necessitating a c-section, then I will be able to try a normal delivery. But I know the chances of needing a c-section, with twins and 2 c-sections already under my belt, is pretty high and I'm prepared for that outcome if necessary. "Are you going to be done?" This one always annoys me because the size of my family is between me, Hubby, and God. If I say yes they feel bad that I only have boys, and if I say no they think we are insane. Personally, I do not feel like these will be my last. But when we have more and how many is yet to be determined. "Your belly is so small!" This is often said by people who don't know how far along I am and/or don't know how small I am normally. For me at 20wks I am pretty big. I've heard lots of other twin comments but these are the most frequent. And from what I hear from other twin moms the comments just get crazier after the babies are born lol. I'm so glad for the Internet where I can connect with other moms of twins to get advice. I can remember stuff from my singleton pregnancies and deliveries like what to pack for the hospital, needing natural diuretics after the delivery, breastfeeding, etc. But when it comes to what I should expect with twins it's a whole new world. I've been looking up the best double strollers, how to fit 5 carseats/boosters into our minivan (not as easy as you'd think! ), how to tandem nurse, and so much more. I can't imagine figuring out all that without the wealth of info I can get online from so many other moms going through it. I am so happy that our vacation to Bear Lake is coming up soon! We really need it. It'll be so nice to get away for 5 days and just have fun and relax. We don't get to take vacations very often, so our yearly Bear Lake trip is always looked forward to with much anticipation. One of these days I want to plan a big family vacation to somewhere further away. I've told Hubby that I'd love to go somewhere back East. He spent 2 years in West Virginia and Virginia and has told me how beautiful it is over there. And I have a lot of friends that go to places like Outer Banks, NC and say how amazing it is. It's funny, they would always call it OBX and it took me soo long to realize they were saying Outer Banks. There is an amazing house by Carolina Designs that would make a perfect vacation spot for my family. It's right by the beach and the house itself is a big 5 bedroom place that even had a pool table, game room, private pool, and so much more. It looks amazing and would be so much fun. We could even invite more family to come with us because there is plenty of room for everyone. It would be so fun to take my boys to the ocean, since we live in a land-locked state they haven't ever seen it. 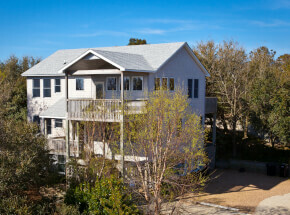 A fun vacation to Outer Banks would be just what we need! For some reason, even though it's only September, I've been wanting to get started on Christmas shopping lately. I know we have 3.5 months to work on it, but I also know how quickly that time goes by. It would be nice for once to not be rushing to get everything the week before. And I've been wondering if we want to do Christmas cards this year. Last year was the first time we have done them, since I got them for free and we finally had a nice family picture to send with them. I'm not sure if we will this year though. I haven't even thought of what to get anyone yet, but especially with the babies being due shortly after it would be nice to be prepared early. Alright, I think I mentioned that Wednesday (yesterday) we were having the ultrasound where we would find out what the baby is. I was supposed to have a regular appointment before the ultrasound but there was a mixup and I ended up having my regular appointment this morning. So we got to the ultrasound early and they got us right back (thank heavens! The boys were already tired and bouncing off the walls). The ultrasound tech was super nice and had another lady there she was teaching. We got started and she was chatting with us about our boys and how many kids we had in our families. I was just waiting for her to really get started and not following the conversation closely, so when she said, "So this will be 5 then," I just kind of looked at Nate confused. She then said, "Did you know that? You are having two." Sure enough, we are having TWINS!!! Oh my gosh! You should have seen how shocked we were. I just kept grinning, and I think Nate asked, "Are you sure?" about a dozen times lol. She showed us each separate baby to prove it. We did a bunch of the measurements and stuff they have to do, then got to the fun part of finding out the genders. Baby #1 showed us right away that he is 100% BOY! One down, maybe we'd get a girl for the other? But nope, little BOY #2 wasn't shy either! Got some very obvious proof that we are having 2 BOYS!!! Holy cow, I will have 5 boys! And before you ask- we did not have an early u/s so this was the first time we saw them so we had no clue, yes twins run in my family and I was in denial that me being bigger this time might be twins, and no we probably won't know if they are identical until after they are born because they have separate sacks but many identicals have separate sacks, though they could as easily be fraternal. And now I have to switch from the midwife group to the high-risk OBs, which kind of stinks, but you do what you gotta do. :) We are shocked but thrilled and so so excited! Today is just one of those days were I wish I were still in bed. It hasn't been a bad day, I'm just exhausted! I didn't sleep well last night (I'll tell you why in a minute) plus I had an appointment this morning, extra kids this afternoon, and homework to do. I have to write a rough draft for my English class. I really really have never liked writing papers. This paper is a "reflection" paper, basically we think of a memory, picture, item whatever and write about it. So if you have fond memories of your grandpa sitting in a porch swing smoking Backwoods cigars or something like that, that's something you could write on. It's actually not too hard. In about half an hour I have a little over 2 pages. It has to be 3-3.5 pages so I'm pretty close. And at least it's not due until Saturday so I have time to do some revising (it needs a lot of work) and fleshing out. I had some great ideas for the paper, but of course I never wrote them down and now can't remember all of them lol. Hopefully a few comes back to me or I am at least able to provide more details on the stuff I already have. And I'm happy it's just a rough draft that's due, not a completely finished paper.